Pedro Kim, President and CEO of Samsung Latin America (left), Elise Bouvet, Manager of the UNV Online Volunteering Service (centre), and Amanda Mukwashi, Chief of the UNV Volunteer Knowledge and Innovation Section (right). Global leader in technology, Samsung, has just announced an unprecedented partnership with the United Nations Volunteers (UNV) programme the UN organization that contributes to peace and development through volunteerism worldwide. UNV values volunteerism as a powerful means of engaging people in tackling development challenges. UNV’s Online Volunteering service connects volunteers with organizations working for sustainable human development. Volunteers contribute their skills online to help organizations address development challenges. Organizations collaborate with online volunteers over the Internet to strengthen the impact of their development work. UNV aims to expand the global reach of the UNV Online Volunteering service and explore innovative methods to ensure the broadest possible participation by all members of society. UNV and Samsung are partnering to harness this largely untapped and vast resource for peace and development, and where possible scale up corporate, online and mobile volunteering. In addition to enhance the exchange of best practices with UN Volunteers, Samsung aims to diversify its volunteer practices, impact a higher number of people positively and become a global benchmark in these activities. The UNV-Samsung cooperation will start as a pilot in Brazil, which hosts the headquarters of Samsung’s operations in Latin America. Initially, the company will contribute to promoting online volunteering and UNV’s service in Brazil and later will extend the activity to other Latin American countries. Samsung will provide support to partner non-governmental organizations from several sectors to leverage the services provided by the UNV Online Volunteering service and will encourage its employees to volunteer online in the new environment, which aims to engage as many volunteers as possible. Representing a first for the private sector, Samsung aims to expand online volunteer activities that can benefit organizations and people around the world and contribute to achieving the Sustainable Development Goals. 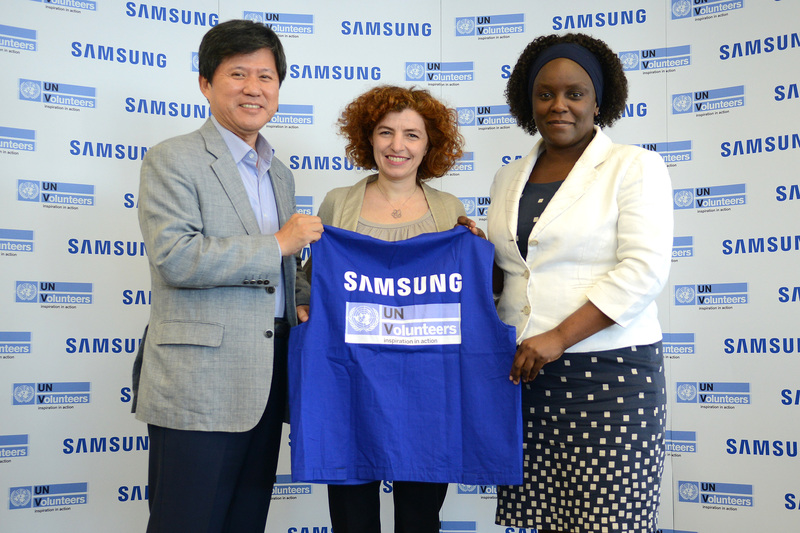 Pedro Kim, President and CEO of Samsung Latin America, and Amanda Mukwashi, Chief of the Volunteer Knowledge and Innovation Section of UNV announced the partnership on Monday 18 April 2016 in the Samsung regional office in São Paulo. “We are very proud of this innovative partnership with UNV. For us, at Samsung, this action represents a major step in our commitment to volunteer actions, which have been established in the Company for over 20 years”, said Pedro Kim, President and CEO of Samsung Latin America. This cooperation with UNV further strengthens the commitment that the South Korean company has made to volunteering. Samsung promotes global and local programs, in order to dedicate human and technological resources to improve the local community and positively impact people taking part. Engaging its employees in online volunteering, the company hopes to promote networking between its offices in Latin America to foster volunteerism and thus enhance their positive impact. UNV is strengthening its innovation by pursuing co-creation related to corporate volunteering for the SDGs with multiple and new partners, including the private sector, governments, the UN and volunteer-involving organizations. This will allow for a better mix of skills that are more attuned to the challenges of the local and national context. Samsung promotes local volunteering actions throughout the year involving its employees in visits to social institutions, such as NGOs, and in the development of activities with children and adolescents. Helvio Kanamaru, Senior Manager of Corporate Citizenship at Samsung for Latin America, mentions the importance of voluntary action for the company: “Our volunteers complete the initiatives we developed with students, communities and entities supported by the company in the countries where we operate. Through volunteering, Samsung also enables its employees to take part and learn more about the company’s Corporate Citizenship platform”. Every year, in October, Samsung also promotes Global Volunteering Month, an activity that aims to benefit hundreds of people, through a schedule of diverse actions to serve the community. In the last three years, Samsung’s volunteering program counted on the participation of nearly 1,500 Samsung employees in Latin America. These volunteer activities have taken place globally since 1994.